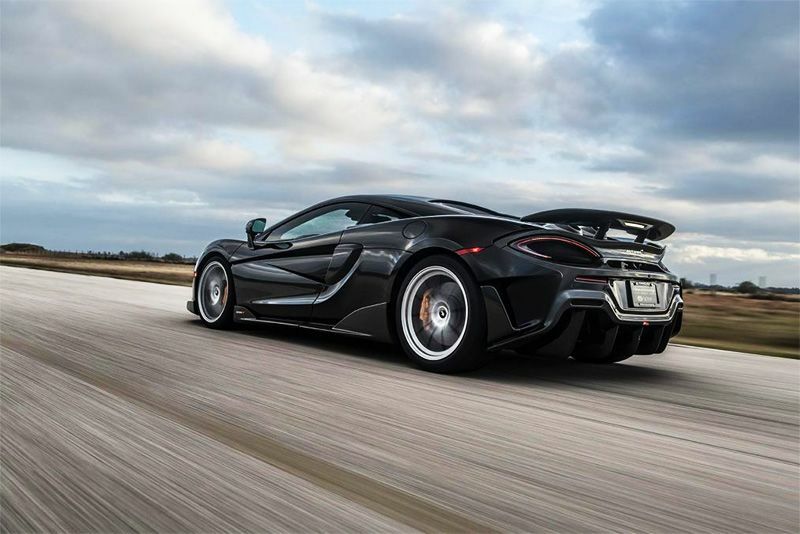 The chaps at Hennessey Performance in the U.
S. got their hands on a McLaren 600LT and have created a 1000bhp plus Speedtail chaser. Most of us would think the McLaren 600LT's 592bhp was quite enough but Hennessey Performance believes more is better. So, they've created not one but three tuning packages for the McLaren. Yup, you can now choose either 700bhp, 800bhp or 1000bhp options depending on how quickly you want to liquidise your organs. And that's no joke, the most powerful option here will take the 600LT from 0-60mph in a blistering 2.1secs. According to Company founder, John Hennessey, "We're going to try for a record against McLaren’s Speedtail from 0-150." To clarify what he's saying, Mclaren has claimed that their Speedtail takes 12.8 seconds to go from standstill to 186mph, which means Hennessey is expecting a much lower figure than that to beat the hypercar. With that said, let's take a look at what Hennessey is offering. First up is the HPE700 package with 708bhp and 635lb ft of torque. The package includes high-flow air filters, a re-calibrated factory Engine Control Unit and an all-new stainless steel exhaust system. Hennessey claims figures of 0-60mph in just 2.6secs and a quarter mile time of 10.5secs at 139mph. Then we have the HPE800 package with 805bhp and 722lb ft of torque, which is more powerful than the £750,000+ Senna. It receives similar treatment to the HPE700 but also includes modifications to the factory turbo and intercooler systems to crack the 800bhp mark. It takes just 2.4 seconds to smash 0-60mph and will complete the quarter mile in 10.1secs at 144mph. Last up is the HPE1000. Here, you are greeted with 1001bhp and 865lb ft and will crush 0-60mph in 2.1secs. It'll travel the quarter mile in just 9.6secs at 156mph. Wow. To achieve this, there has been a significant amount of modification under its bonnet. Pop the lid and you'll find an aftermarket ECU from Motec, Hennessey turbo headers, upgraded turbos, a high-flow wastegate system, reinforced gearbox, Hennessey stainless steel exhaust and a new intercooler system. The only real downside to all of this is that, unlike the other two packages, Hennessey doesn’t provide a warranty with the HPE1000 modifications. Most would feel these mods are unnecessary but if you already own a McLaren 600LT, then perhaps going faster than most other hypercars is an enticing proposition.